Reform Sports provides a premium range of Sports Parquet Flooring (hardwood sports flooring) to meet all customer requirements. The perfect construction of the Reffloor wood system makes it the best choice for architects and constractors designing indoor sports fields. The below mentioned Reffloor Sports Parquet Floor system has many features such as special elastic supoorts made from blend of EPDM which ensures surface stability and long durability for athletic performance. The supports have been designed in order to meet requirements of different sports activities on parquet floors. Innovative design provides the most ergonomic solution for sportsmen in order to reduce playing force to recover energy and to increase ball rebound performance. Reform Sports performs regular quality checks on different parameters to ensure excellent slip resistance, scratch resistance and durability. 20mm sports parquet flooring, 26mm sports parquet flooring and instalaltions types affects prices. Our sports parquet flooring systems are usually implemented in the FIBA approved basketball court. Who wants to have a quality hardwood basketball court floor is the ideal floor for indoor sports halls. 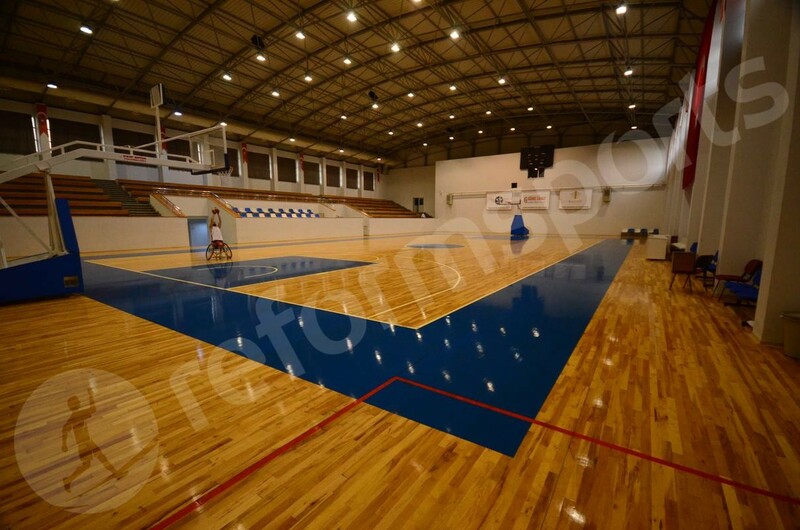 We also have the best quality for multi-purpose indoor sports hall floor with parquet sports flooring systems. You can get from us the technical information for parquet basketball court construction.